Budgets are tight these days. As a result, most brides are being forced to get creative for their weddings to make every dollar they spend work as hard as possible. One way you can save some cash is to choose flowers for your bouquet—and all the other blooms for your bridal party— that are in season. Seasonal flowers are plentiful, which brings down the costs. A hand-tied bouquet is easy for any bride to create herself. Just as important for your budget is to work with your florist and let him or her know exactly what you can afford. Your florist can then guide you in choosing optimal bloom and designs that fulfill the look you desire within your price range. Yet some brides are in such a budget bind that no matter how they work the numbers, they simply can’t afford the services of a florist. If that’s the case with you, don’t give up hope. 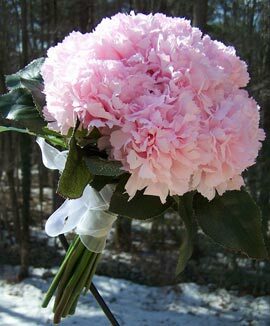 You can still have a lovely bouquet to carry down the aisle. And you’ll have the added satisfaction that you created it yourself. 1. They are plentiful year-round, which typically means they are very affordable. 2. They are easy to work with because of their straight stems and minimal foliage. 3. They allow you to create a sophisticated, monochromatic look. To create your bouquet, first strip any foliage off all the stems. Next, grasp three stems in one hand. Hold the blooms just beneath their heads keeping the heads close together. Then, add individual stems around those in the middle, turning the bouquet as you place each stem to fill in holes and start to enlarge the overall bouquet. Place each “level” of flowers slightly lower than the original three so that you create a “mounded” effect. Continue adding stems until you have reached the size you prefer. If some flower heads are too low, slightly loosen your grip on the bouquet so you can gently lift that head to the height you need. Once your bouquet is complete, use floral tape (available from crafts/hobby stores, or simply use a long twist-tie or rubber band) to wrap around the stems to hold them in place. Place the tape as close as you can to the heads of the bouquet to keep them bunched closely together. Wrap more floral tape about 2 to 4 inches above where you intend to cut the stems. Next, take a length of ribbon to match or contrast with your flower color and being to wrap the ribbon around the stems to cover the rubber bands/twist ties. Once you have completely covered the stems, use decorative pushpins to hold the ribbon in place. To maintain the bouquet’s freshness until your ceremony, fill a container with water to a level that allows you to place the bouquet into the container so the stems are submerged but your ribbon stays dry. Add flower food/preservative to ensure the longevity of your blossoms. Once the ceremony is over, you can place your bouquet back into its container and use it to dress up a table at the reception. You can find great how-to videos all over the web, simply go to www.YouTube.com and search. One that is particularly well-done is available from Lilly of the Valley Florist in La Quinta, California, U.S.A.
One other reference: For creative brides who want to push their bouquet-making skills to the next level, you can find inspiration for some gorgeous, well-crafted bouquets by well-known floral designer Rene Van Rem. His book, “Rene’s Bouquets: A Guide to Euro-Style Hand-Tied Bouquets ” is available from a variety of online booksellers—including www.Amazon.com . Great article! I love your ideas and tips … Thanks! Brilliant advice Gina, and thanks for your comment Michelle.